We are celebrating a family reunion of sorts at Rough Point this season. 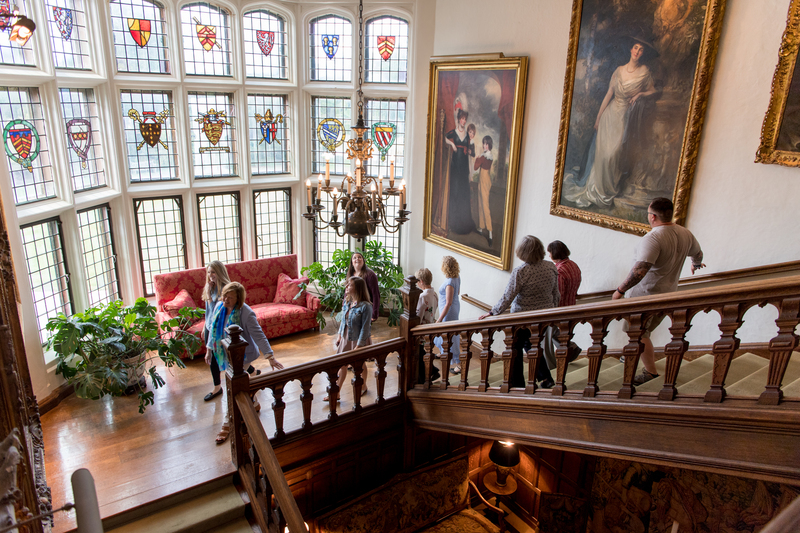 For the seventeen years that the mansion has been open as a museum, full-length portraits of Nanaline Duke and Doris Duke have hung at the top of the grand staircase leading to our second floor galleries and Doris Duke’s bedroom. 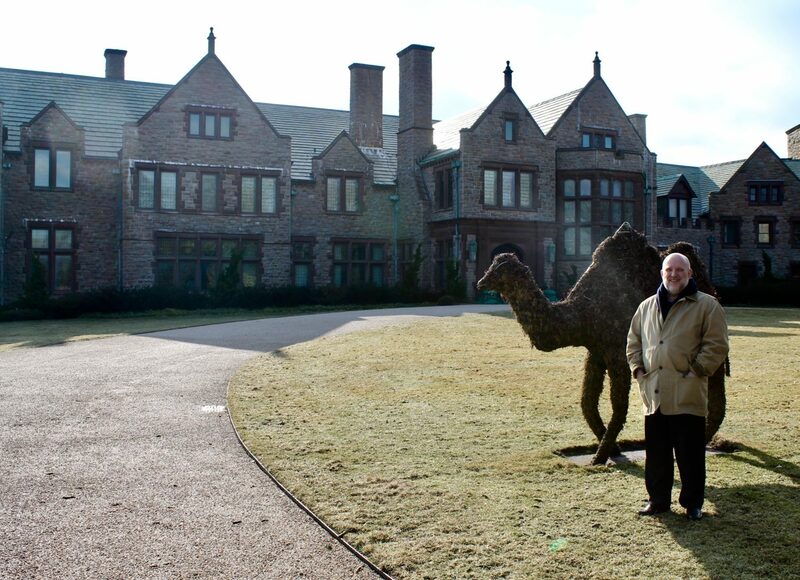 Nowhere in the house could you see James Buchanan Duke, who bought the estate in 1922 from Princess Anastasia of Greece and Denmark (the former Mrs. William B. Leeds). Doris Duke might have displayed photographs of her father during her lifetime, but after her death in 1993, all personal documents and photographs were removed by her estate in preparation for the transfer of the mansion and its art and antique furnishings, in accordance with her will, to the Newport Restoration Foundation (NRF). There were painted portraits of James B. Duke elsewhere – at Duke University, the Duke Endowment, and the National Portrait Gallery, but not on view at Rough Point. That is, until now. 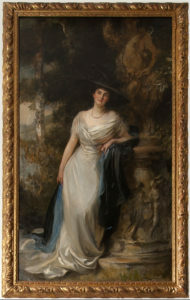 A fourth painted portrait, by British artist John Da Costa (1867-1931), was given to NRF by the Doris Duke Charitable Foundation in 2004 (fig. 1), but darkened varnish and a sagging canvas support had made this portrait unexhibitable when it first came to us, and its original carved and gilded frame had suffered considerable damage over the years. In short, Mr. Duke needed some work, and with the focus of this year’s exhibition, Nature Tamed, on the landscape and gardens at Rough Point throughout its whole long history and under all owners (from Frederick Vanderbilt to NRF), the time seemed right to get Mr. Duke out of storage and onto a visible wall at Rough Point. In late February, we sent the portrait and frame to the Williamstown Art Conservation Center (WACC), which shares facilities with the Clark Art Institute in Williamstown, Massachusetts. At WACC, director Thomas Branchick cleaned the painting, stabilized its canvas support, addressed all other areas of damage, and gave the portrait a new layer of varnish to protect the painted surface. 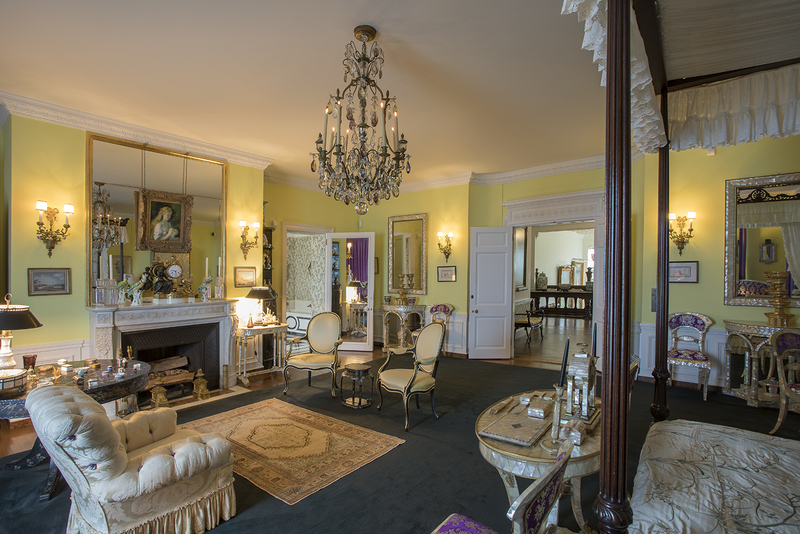 To restore the frame, furniture and frame conservator Hugh Glover replicated several missing pieces of ornate scrollwork and then painted the new surfaces to match the aged appearance of what remained of the original carved and gilded molding. Mr. Duke returned from the Berkshires on April 4 (fig. 2), and you can now see him on the second floor landing in close proximity to the portraits of wife Nanaline (fig. 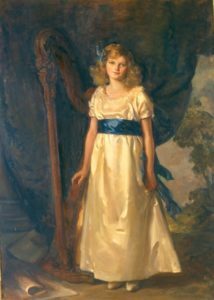 3), painted by Sir James Jebusa Shannon (1862-1923) around the time of her marriage to Mr. Duke in 1907, and daughter Doris at age ten or eleven (fig. 4), painted, like the portrait of her father, by the Englishman John Da Costa. 2. 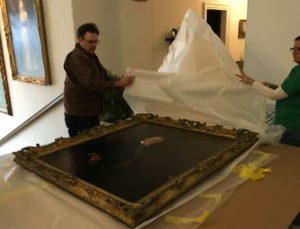 Curatorial and conservation teams unpacking the restored portrait of James B. Duke on April 4, 2017. 3. Sir James Jebusa Shannon, R.A. (United States and England, 1862-1923), Portrait of Nanaline Duke, ca. 1907, Newport Restoration Foundation, Rough Point Collection, 1999.652. 4. John Da Costa (England, 1867-1931), Portrait of Doris Duke, 1923, Newport Restoration Foundation, Rough Point Collection, 1999.653. The lasting legacy of Washington Duke, and we’re not just talking about money . . . 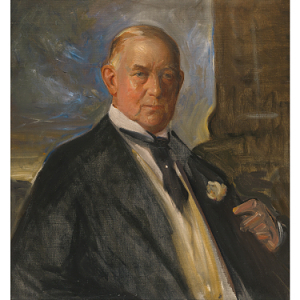 In preparing to bring the family back together, we became aware of one of the other portraits of Mr. Duke by John Da Costa – a 1922 oil sketch (fig. 5), now in the National Portrait Gallery in Washington, D.C., which appears to be a study from life for the Rough Point portrait. Between the 1922 and 1924 portraits, however, Da Costa changed the setting from an impressionistic exterior with blue sky to a non-descript, dark interior. Why the change? We suspect James B. Duke’s father, although dead for 19 years at that point, might still have had something to do with it. 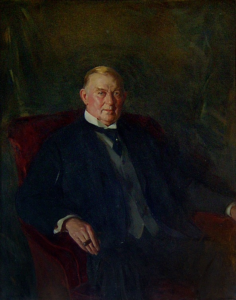 Our portrait is a near identical twin to the portrait of James B. Duke that now hangs in the Gothic Reading Room of the Duke University Libraries (fig. 6). Adjacent to this “twin” is a posthumous portrait of Washington Duke (1820-1905) in the same dimensions and with a similarly dark interior background and red, upholstered chair (fig. 7). Both of the Duke University portraits date to 1924, as does the Rough Point portrait, and all were likely commissioned to commemorate the $40 million donation made by James B. Duke to the Duke Endowment that same year. The Duke Endowment supported several North Carolina colleges, including Trinity College in Durham, which would later be renamed Duke University in honor of Washington Duke’s legacy of giving to the college. 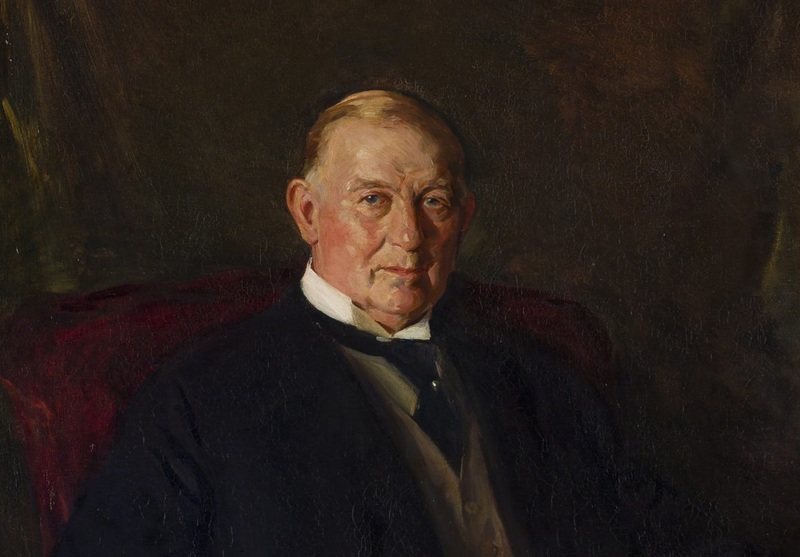 As a model for the posthumous portrait of Washington Duke, Da Costa used a 1904 portrait by Abraham Edmonds (Fig. 8; also now in the Rough Point collection), in which the senior Duke is similarly posed in a dark interior. For visual consistency, it seems that Da Costa simply adapted the Edmonds composition and setting for his portraits of both father and son destined for Duke University, and by extension to the version of the James B. Duke portrait intended for the family. Thus, we have Washington Duke and Abraham Edmonds, both long gone in 1924, to thank for the somber, dark interior. 5. John Da Costa (England, 1867-1931), Portrait of James Buchanan Duke, ca. 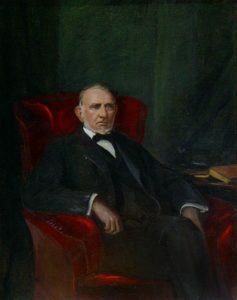 1922, National Portrait Gallery, Smithsonian Institution; gift of T. Bragg McLeod, NPG.82.149. There were other benefits to bringing James B. Duke back into the public view. When conservators had a close look at the back of Mr. Duke’s frame they found a stamped maker’s mark: “M. 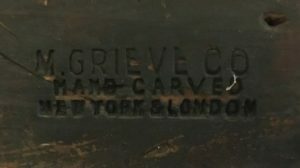 Grieve Co., Hand Carved, New York & London” (fig. 9). Maurice Grieve (fig. 10) relocated his family’s two-century old wood carving business from Belgium to New York in 1906 and closed the shop upon retirement in 1955. 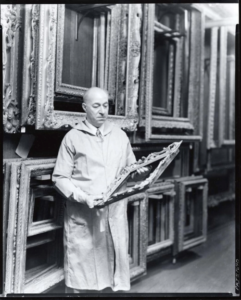 His carved and gilded frames represented the pinnacle of the craft and were highly sought after by dealers, collectors, and institutions in the first half of the twentieth century. Most famously, Grieve made the frame for Gainsborough’s Blue Boy after its controversial sale to the American industrialist Henry Huntington in 1921. Only a few years after making the Blue Boy frame, Grieve was commissioned to carve the frame for John Da Costa’s portrait of James B. Duke, now reunited with the other two family portraits at Rough Point (fig. 11). What young Doris Duke thought of all of this is still a mystery. From the expression captured by John Da Costa (see fig. 4), one might guess there were places she would rather have been than in the artist’s studio. 8. 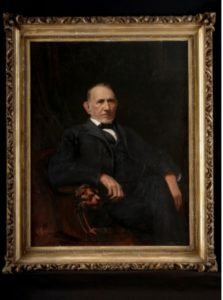 Abraham Edmonds (United States, 1850-1910), Portrait of Washington Duke, 1904, Newport Restoration Foundation, Rough Point Collection, 2006.585. 9. The M. Grieve Co. stamp on the frame of the portrait of James B. Duke at Rough Point. As a scholar of the late nineteenth and early twentieth centuries, but one who has—until recently—had little opportunity to spend time in New England, I have developed a particular, though less than fully informed, vision of the wealthy women and men who called Newport their summer home and what their so-called summer cottages must have looked like. 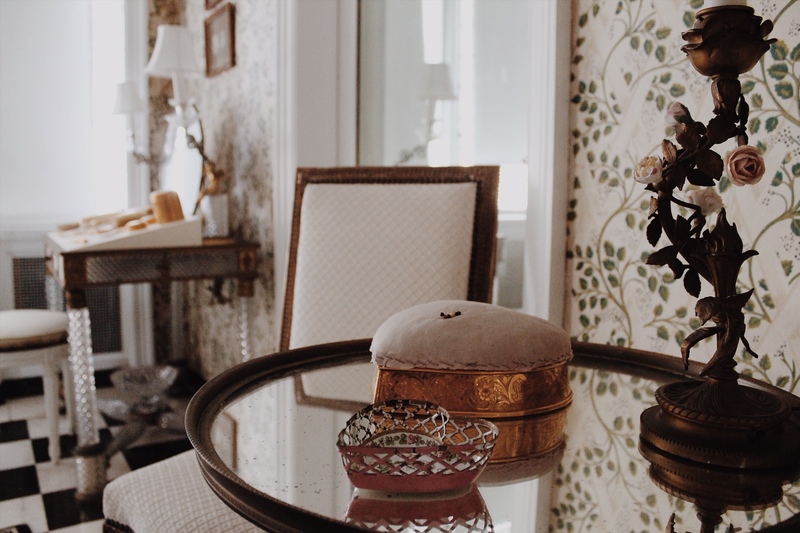 Hearts may not have been one of Doris Duke’s favorite design motifs, but heart shapes can be found in several places throughout her Newport estate. In honor of Valentine’s Day, we’re taking a closer look at some of the hidden hearts in the fine and decorative arts collection at Rough Point. Join us this Fall for more events celebrating this year’s theme of NRF at 50!